Free optional color-coded left and right clicks (plain-black version also available). Ergonomic and easy to use - simply connect to a USB port on your system and you are ready to go. That easy! 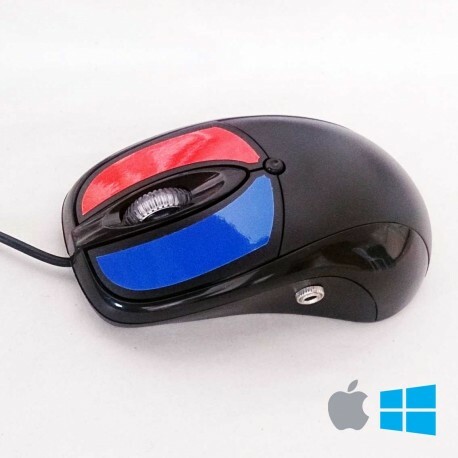 Not only does it work as a standard mouse, it also allows you to connect 2 standard switches and make use of the left and right click externally! The color-coded version (blue left-click and red right-click) is perfect to help users learn and memorize which buttons to press. It is automatically recognized by the computer when you plug it to a USB port. Just plug & play. It is fully compatible with both Windows and Mac systems, and other systems with USB port available. It can be used as an alternate access method to your computer to play games or interact with software that works with left and right mouse clicks. It can also be used as a regular USB mouse. You don't need to install any drivers just plug it in and it is ready to go.